A year ago, I made Pierson a Yo Gabba Gabba cake for his first birthday, and everyone loved it :) This year, when my friend asked if I could make him another cake, I was happy to say yes! But this time, it would be themed after everyone's favorite mouse...Mickey! 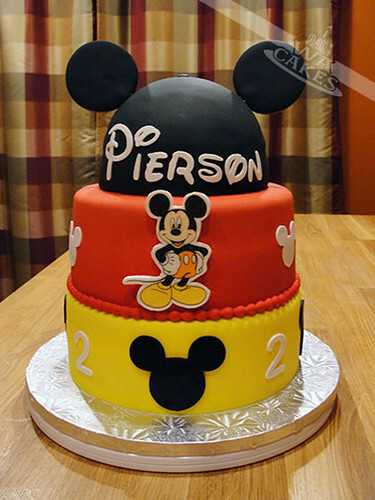 I wanted the cake to represent Mickey Mouse without looking exactly like him. The colors were ordered to copy the colors on the cheerful guy - Yellow (shoes), Red (shorts), and Black (ears). Get it? You got it! A few days prior to baking, I formed the recognizable mouse ears. I rolled out a thick sheet of black fondant mixed with tylose powder. That helps harden the fondant like gumpaste. 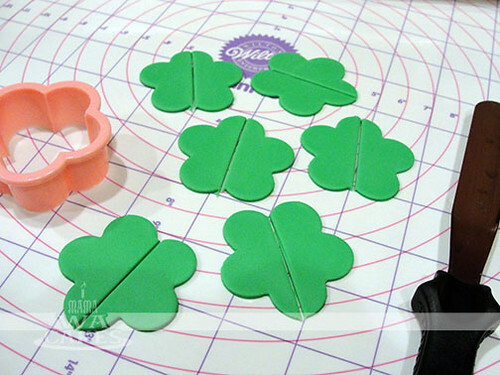 I then proceeded to cut out the two ears with the help of a 3 inch diameter round cutter. 6 inch popsicle sticks were then gently inserted with a touch of gum glue. These were left to dry completely so that they would be nice and firm to handle. Another element that I made ahead of time was the edible plaque of Mickey Mouse. I found an image online and sized it to what I needed, and created a halo around him. I did this because I like the contrast of the white against the cake's color. 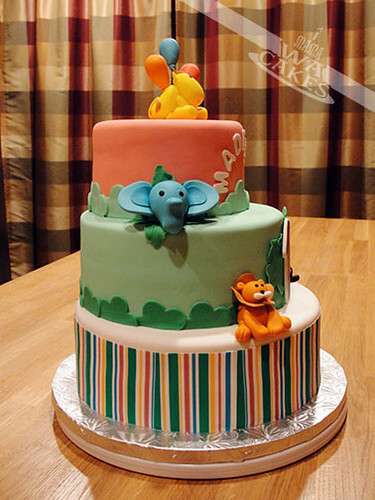 I brushed on a thin layer of clear piping gel onto a thin sheet of gumpaste, and adhered the edible image to it. I allowed it to set a few minutes before I cut it out with an small pen knife. The cake itself was as yummy as it looks! I started with two 9 inch layers, and two 8 inch layers of rich chocolate cake. These were then filled with a toasty, gooey coconut filling. I love these two flavors together, Yum! The Mickey hat was also the same flavor, but was baked in half of a Wilton Sports Ball Pan. 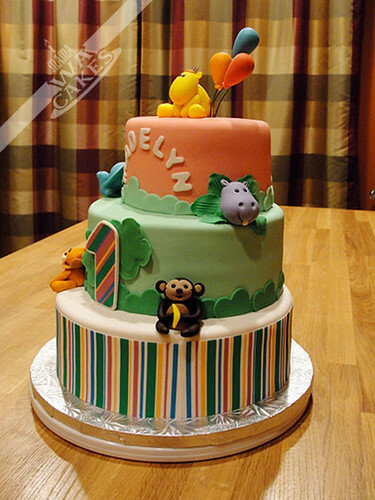 All the layers were then covered in fondant and stacked, making sure that they level and straight. 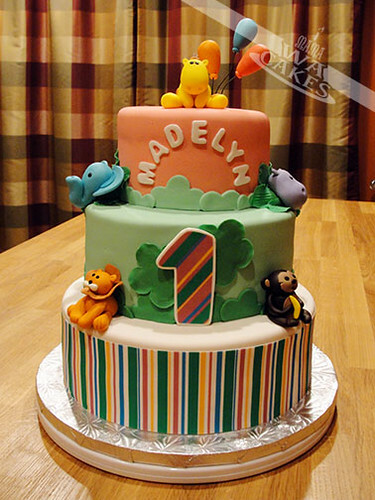 Fondant decorations were then cut out to embellish the sides of the bottom two cakes. 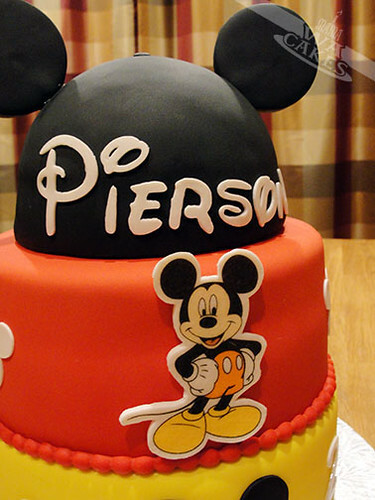 Pierson's name was cut out in the same style as the Disney's logo, of course. It's starting to look like a hat I once owned when I was young. 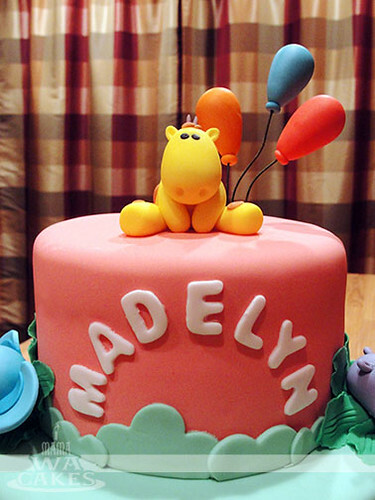 For final touches, I attached the edible plaque to the cake with some melted candy coating, and carefully inserted the ears into the hat part, making sure they were even. 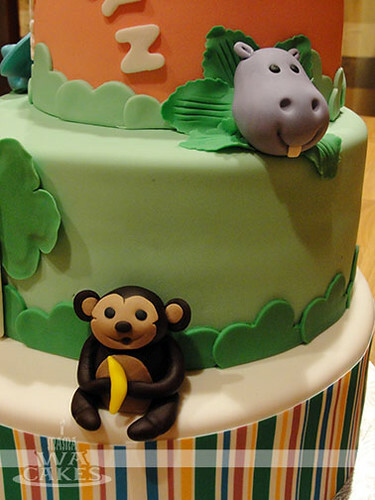 The finished cake almost had me singing, "M-I-C-K-E-Y, M-O-U-S-E!" 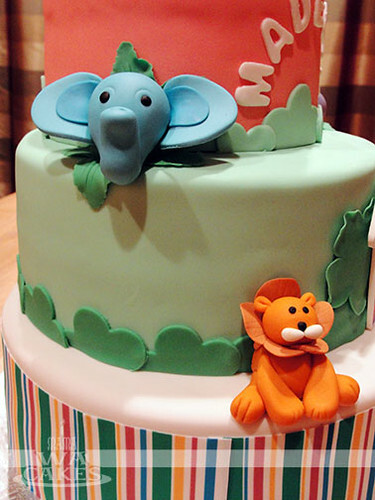 I was totally excited about making this cake earlier this month. 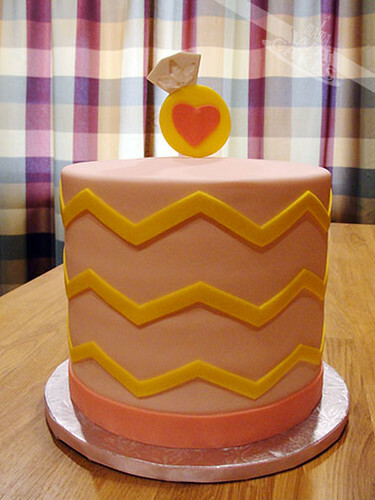 I not only got to design a cake based the latest chevron trend. but I also got to try a new method I learned on Craftsy.com. It's the wax paper method taught by Jessica Harris. 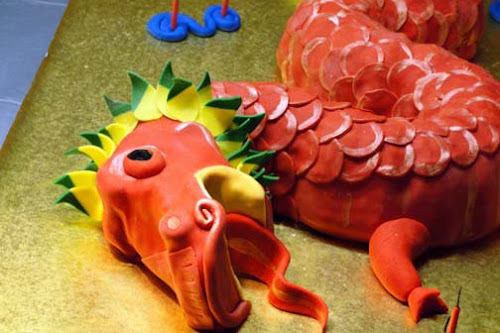 I wish I knew about this method years ago when decorating some other cakes. It would've made things so much easier, and would've kept me sane! 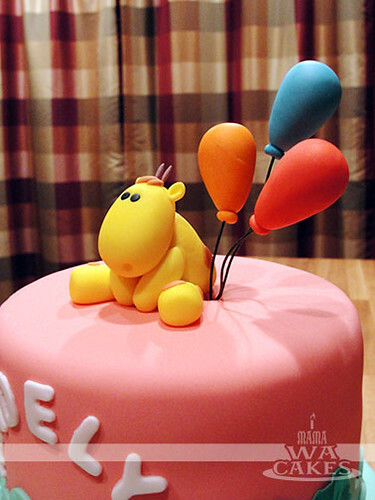 This tall cake is made of alternating layers of chocolate and strawberry cake filled with strawberry preserve. I wish I had a photo of the served cake just so you could what the layers looked like. 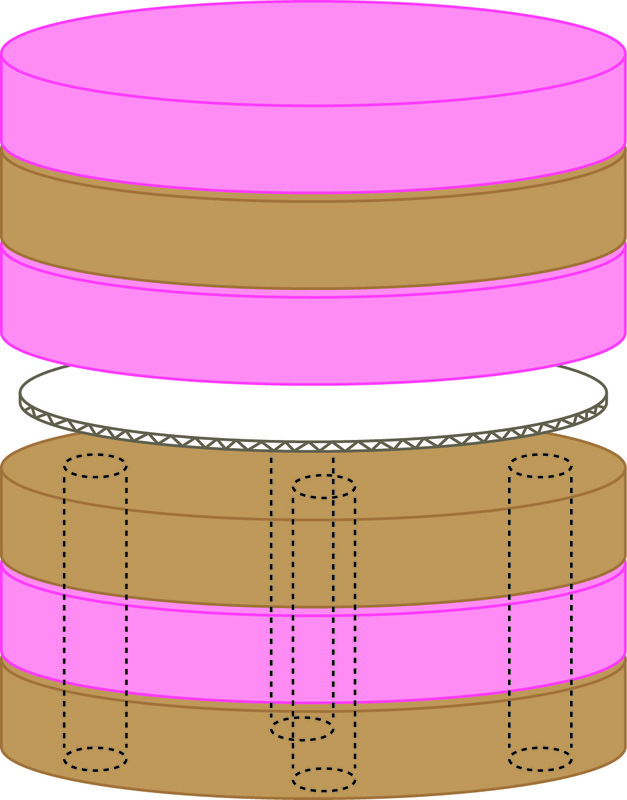 Whenever a cake is so tall, I like to separate the cake in half with a hidden cake board that is trimmed slightly smaller than the diameter of the cake. Boba straws were inserted into the bottom half to support the weight of the top half. I find that Boba straws are easier to use and cut than wooden cake dowels. This trick makes the cake stable and easier to serve, because cutting an 8" tall slice of cake can be a bit tricky and messy. 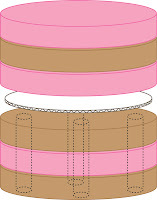 I made an illustration of the cake construction so you can see what I did. I hope that helps! All the layers were then crumb coated in buttercream, with some piped into space around the middle to hide the cake board. The cake was then covered in a blanket of soft pale pink, and the bottom edge was finished with a darker pink ribbon of fondant. Now, here comes the fun part...Chevrons!!! 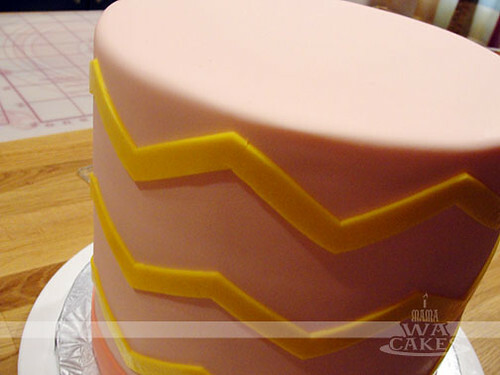 For the chevrons, I measured the circumference of my cake after I covered it with fondant. I then used that number and created my chevron template to cut out them out with, but this is where the wax paper method comes into play. 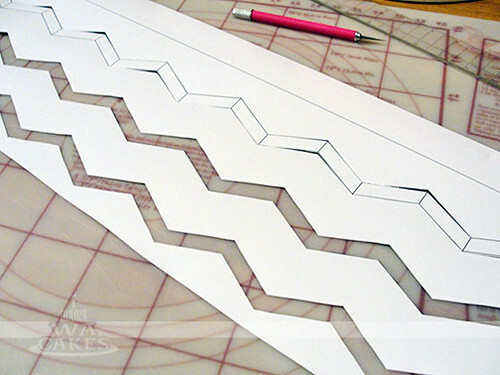 Instead of just cutting out long strips of the chevron and painstakingly trying to align them on the cake, I cut them out on a long sheet of wax paper that is the height and length of my cake. 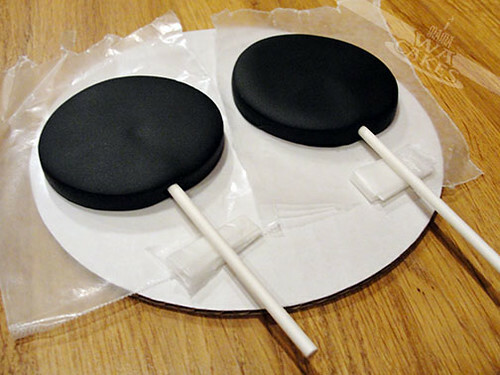 The cut fondant sticks to the wax paper in the same positions as if they were on my cake. 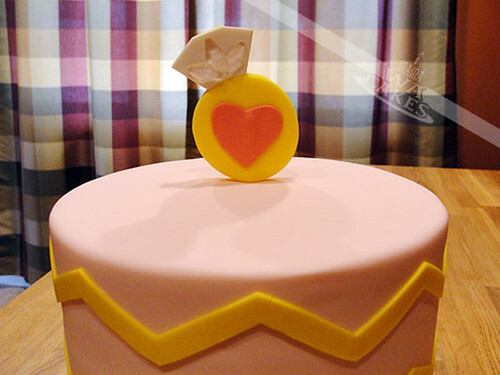 I then transfer the chevrons onto my cake by aligning the wax paper with my cake and wrapping it around and meeting up at only one seam. Tada! Not that the cake wasn't pretty with just the chevrons, but I just had to make a ring topper that had some sugar diamonds on it. No wedding ring is complete without any type of bling on it :) I made this by hand cutting out two layers of the ring shape, and sandwiching a popsicle stick in between. I then cut out a heart for front and a white layer for the diamond. With some sugar glue, I attached the three sugar diamonds to the white diamond area. 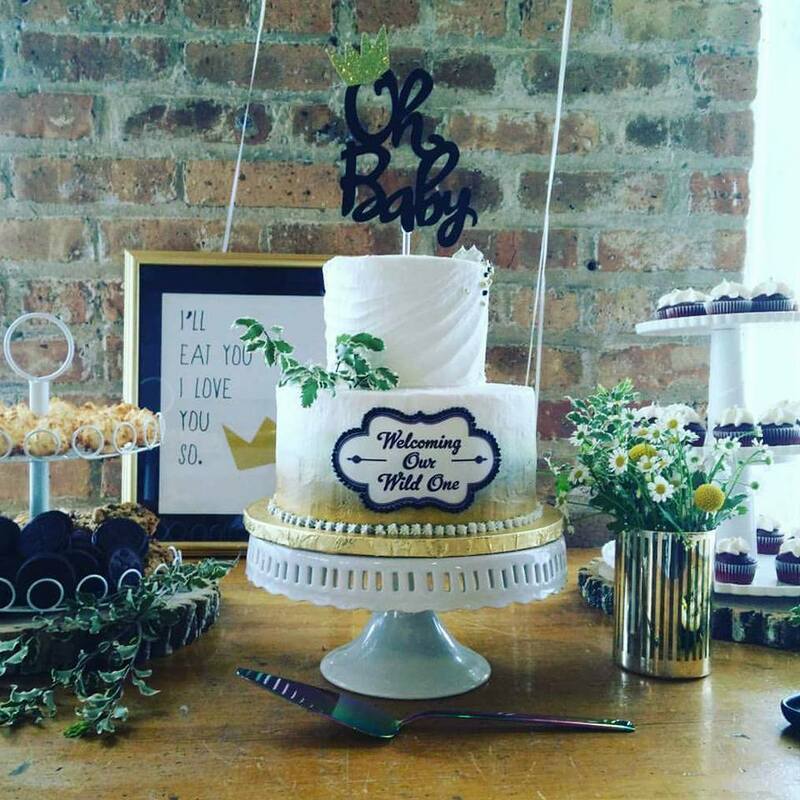 This was definitely a fun and pretty cake for such a special event. Congrats Stephanie!